EDlection2018: This is one of several dozen races we’ve analyzed for the 2018 midterms that could go on to influence state or federal education policy. Get the latest headlines delivered straight to your inbox; sign up for The 74 Newsletter. 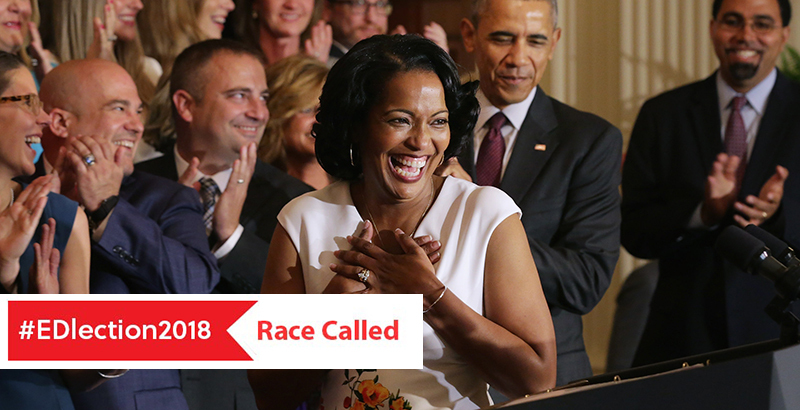 Democrat and 2016 National Teacher of the Year Jahana Hayes made history Tuesday night, becoming the first black woman elected to Congress in Connecticut. New York Times projections show Hayes beat Republican challenger Manny Santos 56-44 — with 81 percent of precincts reporting — to represent the 5th Congressional District, which is Democratic and mostly white. The outcome mirrors poll predictions that gave Hayes a comfy lead. Santos hadn’t conceded by midnight, calling Hayes’ declaration of victory “premature.” He is a military veteran, immigrant and the former mayor of Meriden, Connecticut. An educator in Waterbury Public Schools for 15 years, Hayes became a star political newcomer in an election cycle underscored by nationwide teacher strikes and educator activism. She advocated for increased education spending, “common sense gun reform,” bolstered support for teachers and college affordability. Hayes has also voiced support for transgender student rights and denounced arming teachers. The mother of four regularly generated media headlines for defying the odds — in her personal life and on the campaign trail. Hayes grew up in Waterbury, Connecticut’s housing projects, was temporarily homeless and gave birth to a daughter at 17. But after earning three college degrees and working for years as a high school history teacher, she nabbed the 2016 National Teacher of the Year Award, receiving accolades from President Barack Obama. “She gets through to her students precisely because she remembers what it was like to be one of them,” Obama said at a White House ceremony in May 2016. Hayes mounted her campaign this year while working in the school district’s central office, where she mentors new teachers. Though she failed to win the endorsement of the Connecticut Democratic Party, Hayes clinched an unexpectedly sizable primary victory — earning 62 percent of the vote — over seasoned opponent and local city official Mary Glassman in August.